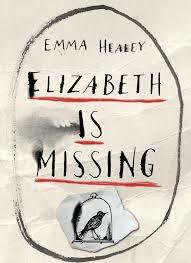 The octogenarian narrator of Emma Healey’s debut novel Elizabeth is Missing, cannot remember what she did a few moments ago. Her hallway is littered with cups of tea that she made but forgot to drink; kitchen cupboards overflow with cans of peaches she can’t remember buying. She’s forgotten her daughter’s instruction that it’s not safe for her to go out unaccompanied. At times she even forgets she has a daughter. But of one thing Maud is certain: she has a friend called Elizabeth that she hasn’t seen or heard from recently. She also remembers she once had an older sister called Sukey who disappeared without trace seventy years ago. Despite Maud’s determined efforts she never discovered what happened to the sister she adored. She is resolved that Elizabeth will not suffer the same fate. For Maud is convinced that her friend is missing and she, Maud, must find where she has gone. The fact she can’t actually remember when exactly she last saw Elizabeth (last week? last year? ) and that no-one else takes her concerns seriously, proves no obstacle in her dogged pursuit of the truth. As her obsession takes hold, memories of the past flood back for Maud and questions that had puzzled her then about Sukey’s disappearance are re-ignited. Past and present are woven together in this novel as the twin mysteries of the missing women ultimately converge. As a narrator, Maud is as unreliable as it’s possible to be. Healey’s portrayal of the effects of dementia is however finely observed and apparently owes much to the author’s own family experience. In an interview with the newspaper in her home town of Creetown in Ireland, she explained that the initial inspiration for her book came from observing the confusion and forgetfulness that were the first symptoms of dementia in her paternal grandmother. This isn’t a subject that would naturally lend itself to humour but Healey manages to deftly balance the bleakness by making Maud an irascible figure given to occasional flashes of waspish reflections on how society treats the elderly. I keep my spare pair of glasses in it [handbag], I only really need glasses for reading but they make you wear them all the time once you reach a certain age. It’s part of the uniform. How would they know you were an old duffer otherwise? They want you to have the right props so they can tell you apart from people who have the decency to be under seventy. False teeth, hearing aid, glasses. I’ve been given them all. Moments of dark humour like this are threaded throughout the first half of the novel. As Maud’s dementia progresses and her grasp on the present day dissolves, the humour gives way to an appeal for treating sufferers with greater respect. It was this mingling of meditation on age and identity with a mystery story and a study in personality that made Elizabeth is Missing such an enjoyable read. For a young person (she is still apparently in her twenties) Healey has shown a remarkable ability to describe the emotional state of a woman approaching her ninetieth year. I enjoyed also the way she plays with genre, giving us a book that is not quite crime but not quite literary fiction. An impressive debut.